Back in 2012, under impulse from BELSPO (BELgian federal Science Policy Office), 5 Belgian research teams (KUL, ULB, UGent, ROB and BISA) and two renowned international partners (Durham, Leiden) joined forces to investigate Contemporary physical challenges in Heliospheric and AstRophysical Models (CHARM). This unified effort aims at identifying common grounds across disciplines that vary from solar, magnetospheric and heliospheric, to galactic or cosmologically driven curiosities. These common grounds are found in the high performance computing approaches, in the challenges when confronting models with observations, and in the most enigmatic aspects of the physical processes at work. More info on the CHARM project is here. 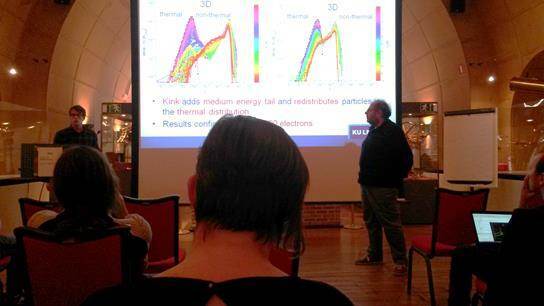 The 2017 annual CHARM meeting took place in the Meridian Room of the Royal Observatory of Belgium on 10 March. The purpose of the meeting was to review the ongoing activities at the 7 CHARM partners up till the end of the CHARM project later in 2017. Nearly 40 (!) 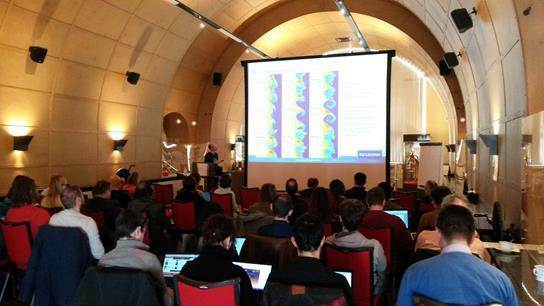 participants indulged themselves in the most profound aspects of magnetohydrodynamic (MHD) turbulence, Kelvin-Helmholtz instabilities, particle acceleration in explosive reconnection, quasi-periodic pulsations in solar flares, mesh-free Hamiltonians (I'm not making this up! ), accretion of clumpy wind in SGXB,... and much more! No less than 16 presentations were given, each lasting 15-20 minutes and topped off with a round of Questions and Answers. The logistical support was of the same high level, and it is rumored that the number of sandwiches and liters of coffee were probably high enough to start a physics model on its own! CHARM is part of the Interuniversity Attraction Poles (IAP), a federal programme that will end this year. A successor has been developed on regional level: EOS (Excellence of Science). The EOS-programme wants to promote joint research between researchers in the Flemish and French-speaking community by funding joint fundamental research projects in any scientific discipline. If CHARM gets selected, it will be able to continue its important role in bringing researchers from various domains together to find common grounds for further collaboration.